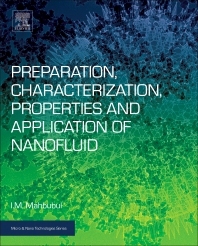 Preparation, Characterization, Properties and Application of Nanofluid begins with an introduction of colloidal systems and their relation to nanofluid. Special emphasis on the preparation of stable nanofluid and the impact of ultrasonication power on nanofluid preparation is also included, as are characterization and stability measurement techniques. Other topics of note in the book include the thermophysical properties of nanofluids as thermal conductivity, viscosity, and density and specific heat, including the figure of merit of properties. In addition, different parameters, like particle type, size, concentration, liquid type and temperature are discussed based on experimental results, along with a variety of other important topics. The available model and correlations used for nanofluid property calculation are also included. This is a good reference book, has full of information. Dr. Mohammed Mahbubul Islam is a Research Faculty at King Fahd University of Petroleum and Minerals, Saudi Arabia. He has several years’ hands-on experience working with nanofluid and nanofluid was his concentration in Post-doc, PhD and Masters. He started his career in industry as an R&D engineer. He was research project manager and researcher and established a complete nanofluid research laboratory in University of Malaya before joining King Fahd University. He has published about 50 nanofluid-related publications in peer-reviewed journals.